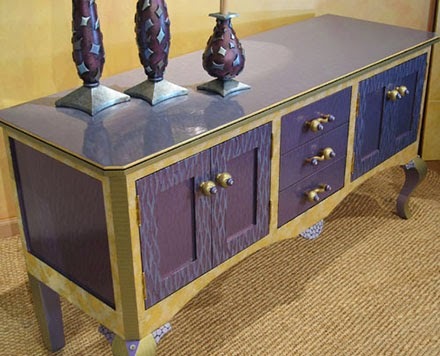 Puregoldstick: Designing with Knobs and Pulls - Get a Scheme Going! 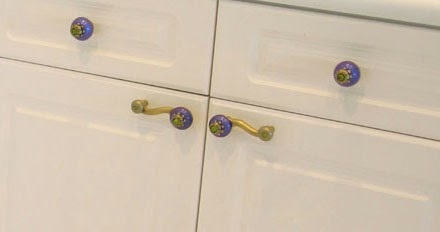 Designing with Knobs and Pulls - Get a Scheme Going! It's easy to see that our knobs and pulls are little works of art. So naturally I like to think of the cabinet door or drawer as the canvas or frame that surrounds it. For a simple or delicate look you can opt for a small knob within a large space or you can be bold and go the dramatic route and use a large knob or pull on a small drawer. So much depends upon the style of the room or the furniture piece. Is it formal, casual, playful, colorful? What kind of attitude or personality are you courting? There's no doubt that both size and placement of your decorative hardware are key in affecting the look you're trying to achieve. To give you an idea of some of your options, I've selected some photos of our asymmetrical Eel pulls to show the various ways they'e positioned on cabinets and furniture. For balance and symmetry our 4 in. Eel Iris pulls are paired with a right and left curve on these kitchen cabinet doors. Drawers have matching Nu Iris knobs 1.5 in.diameter. In this bathroom , our 4 in. Eel Lily pulls are placed in the center paneling of the drawers. Matching Nu Lily knobs 1.5 in. diameter are positioned on the door frame. Although the colors are subtle, int this case the hardware has a bold effect. 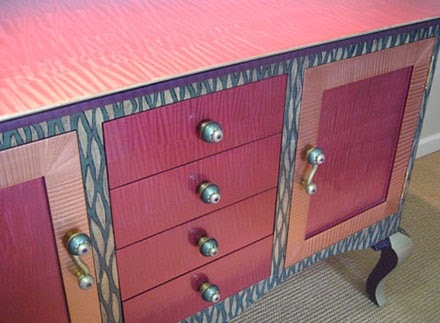 On our Bolero dresser, our 4 in. Eel Lily pulls zigzag down the bank of drawers. Matching Nu Lily knobs 1.5 in. 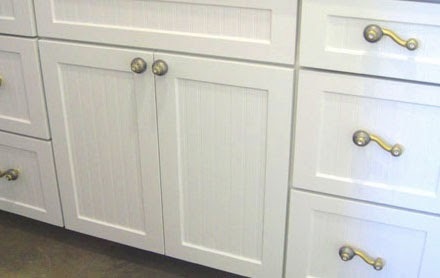 diameter are placed on the cabinet door moldings. For extra drama, we selected a contrasting color scheme for the hardware. Placed vertically on our Bolero dresser, the right and left curve of our 4 in. Eel pulls emphasize and flow with the direction of the artwork. Once again, choice of contrasting hardware colors is deliberate and effective.